Saflex® Solar PVB interlayers are high-visible light transmittance, infrared (IR) radiation-absorbing interlayers designed to enhance solar heat gain performance in laminated glass compared to monolithic clear glass and laminates made with conventional polyvinyl butyral (PVB) interlayer. They have the capability to meet or exceed many regulations for laminated safety glazing when properly selected, laminated, and installed. The ideal solar product eliminates UV and NIR energy while allowing as much visible light transmittance as possible. 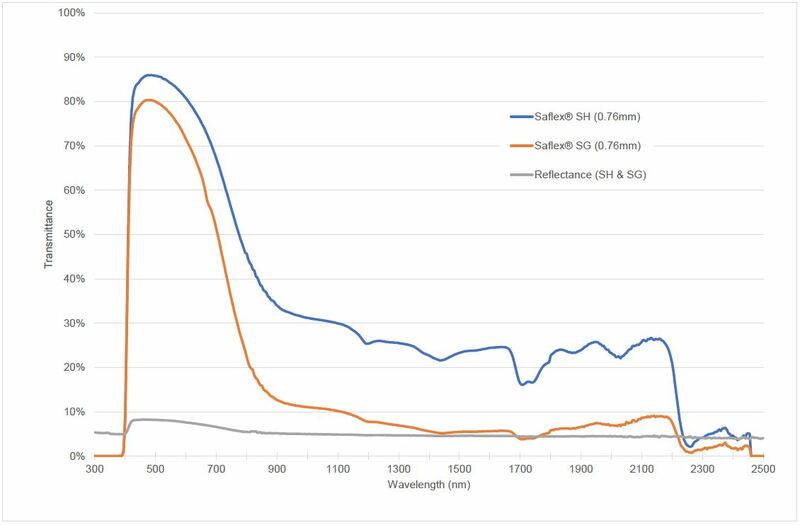 As shown in the below chart, Saflex Solar has the transmittance of a highly effective high-visible light transmittance solar product. Plus, Saflex Solar is specifically formulated to provide exceptional durability when exposed to natural weathering. Saflex Solar is the PVB formulation of choice for applications where strengthened glass is specified to provide additional load or stress resistance (e.g., point-fixed system). Two options are available in the Saflex Solar range: Saflex Solar SG is our highest- performing Solar PVB interlayer, Saflex Solar SH has a more color-neutral appearance and may be laminated with annealed glass in some applications. Saflex Solar is compatible with other Saflex interlayers such as Saflex Clear and Saflex Structural, as well as Vanceva® color Interlayer systems. In specific configurations, Saflex can be advantageously combined with low-e coatings or robust solar control coatings. Want to know more about combining solar control technologies for optimal performance, download our technical brochure. Visible Light Transmittance > 70%. Learn about solar control, glass selection, coatings and more.